Africa has its share of challenges, but it also leads the way in creative development responses. Take the Lake Tanganyika area in Tanzania. Daily life is hard. There are few roads. Cellphone service is patchy. You must travel by boat for seven hours to reach the nearest hospital. And if you have an obstetric emergency, there is no doctor in the village to help you. In these areas, 41 percent of women want to prevent or delay pregnancy but don’t have access to contraception, according to the 2010 Tanzania Demographic and Health Survey. A baseline survey by the Nature Conservancy and Sebastiaan Hess in 2011 indicated that, on average, women here give birth to 6.7 children each. Such high levels of fertility and low access to reproductive health services leads to many avoidable health complications and even deaths for women and children. Bearing and raising so many children also means women don’t have time to be involved in activities outside the home, limiting their ability to seek work or take part in local governance or civic activities. Their health and wellbeing are directly dependent on their natural environment – an ecosystem of critical global significance, vital to the national economy, and increasingly at risk. Lake Tanganyika holds 17 percent of Earth’s freshwater and forms the western boundary of the Greater Mahale Ecosystem – a forested landscape of almost 2 million hectares. The area is marked by rich biodiversity, including 300 unique species of fish. Pathfinder International, the Nature Conservancy, and the Frankfurt Zoological Society have been working at Lake Tanganyika since 2011 under the umbrella of the Tuungane population, health and environment project. It deals with issues in an integrated way, offering a holistic approach for increasing people’s access to health care and economic opportunity while enabling them to sustainably manage their natural resources. In the past, community health workers were trained only on specific health issues. When health workers visited households on their regular rounds, men would often suggest that their wives were available to talk to and then walk away, assuming a discussion about reproductive health was irrelevant to them. Now, local health workers receive cross-training on agriculture, fisheries, and the connections between household health, reproductive health, and the environment. They are finding that both men and women are scrambling to be there when they visit so they can receive information about the issues that matter most to them. Traditional gender divisions are beginning to break down. More men are accompanying their wives to clinics for services such as family planning and prenatal care, and more women are getting involved in local governance and economic activities. The integrated population, health, and environment (PHE) project enables organizations to extend their collective reach and address the multifaceted issues faced by people living around Lake Tanganyika. Evidence is emerging that this approach may hold some of the keys to unlocking a more prosperous future. When our project began, women said their families were not eating as much fish as they had five years ago, because they were catching fewer. To replace the fish, families turned to agriculture. The resulting deforestation and lack of governance of watershed areas led to high levels of sediment being washed into the lakes, further depleting fisheries and leaving families with even fewer options to secure their health and livelihoods. In addition to training health workers to deliver integrated health and environmental messages, like information on how to improve soil retention, the project fosters “model households.” These households take part in activities likely to lead to improved health, food security, and economic and environmental sustainability: they use latrines, “tippy taps” for hand washing, dish racks, kitchen gardens, fruit trees, rain barrels, woodlots, and share knowledge about family planning. These households, in turn, teach others. The Tuungane Project then works to build residents’ capacity for managing resources that require communal action. Our support to establish beach management units – local groups that govern lake resources – has resulted in the protection of critical spawning grounds and in larger fish catch sizes. More than 1,200 fishermen and other stakeholders have joined the beach management units and 13 villages have been verified as fisheries breeding sites by the Tanzania Fisheries Research Institute. The project has also set up model fish-drying racks that eliminate sand, resulting in a threefold increase in their market price. Another initiative helped several villages setup savings and loan groups. These have already saved more than $350,000, enabling people to establish businesses to provide basic household goods, wholesale rice, and other agricultural produce. In addition, 12 health facilities have been refurbished and equipped, and staff members have been trained to provide a wider range of family planning services as well as emergency obstetric care. Already, 9,000 women are using family planning for the first time. Our efforts are aimed at enabling people, especially women, to take control not only of their bodies but of their livelihoods too. Projects that aim to improve people’s health, livelihoods, and natural resources together need to be supported by policies that create enabling environments for them to thrive. The East African Community (EAC) convenes regularly to discuss how to plan for, fund, institutionalize, and scale up such initiatives. Recently, various stakeholders, including Pathfinder International, met to finalize a strategic plan that will be presented to the EAC Council of Ministers for approval. It is a critical step in the process of enabling governments to plan and budget across sectors, thereby using scarce resources – like community health workers – more efficiently. Expanding support for integrated programs will not only expand sexual and reproductive health services and enhance resilience, but help the global community move towards achieving the ambitious Sustainable Development Goals, which aim to end poverty, protect the planet, and ensure prosperity over the next 15 years. Adapted from an article that first appeared on Bhekisisa. Mustafa G. Kudrati is Pathfinder International’s country representative in Tanzania. Sources: Bhekisisa, The DHS Program, National Bureau of Statistics (Tanzania), The Nature Conservancy, Sebastiaan Hess. 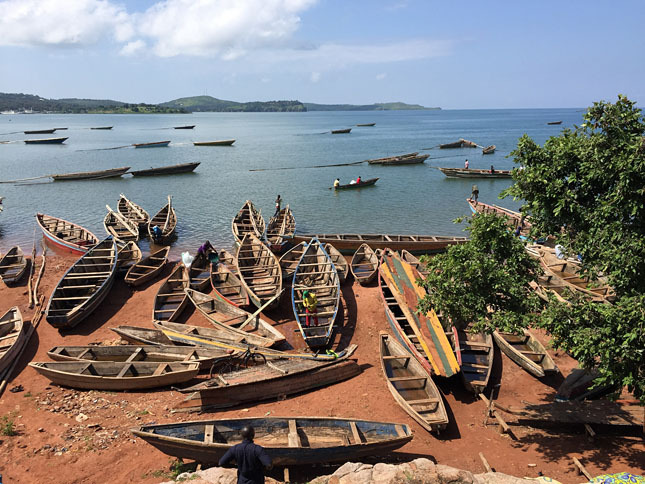 Photo Credit: Kigoma boat launch, courtesy of flickr user Hannah Jane.